The Jumbos’ season has been a rollercoaster ride so far. Despite a recent setback last Saturday against Middlebury, Tufts closed out November with dominant victories over Saint Michael’s (4–0) and Williams (6–2) in a three-game win streak that saw the team outscore opponents 13–2 and climb back to .500 to finish the month on a high note. Tufts’ win streak ended with the arrival of December, however, as the month opened on a sour note that saw a lopsided 6–2 loss to Middlebury. Sophomore goaltender Drew Hotte continued his strong goalkeeping with 31 saves, but 37 Middlebury shots proved too much to handle in the end. 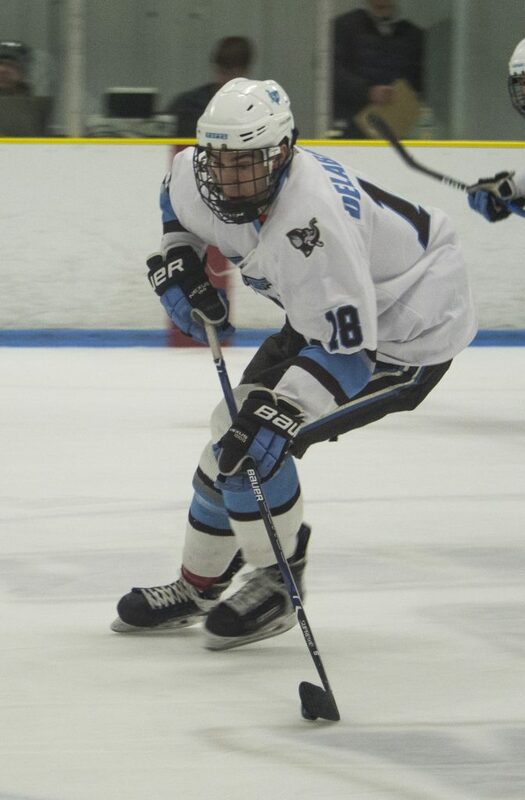 First-year forward Nick Schultze said that the team needed to improve its defensive performance. However, Tufts matched Middlebury in numerous statistical categories, winning 29 faceoffs to Middlebury’s 31 and matching its power-play success rate (1-for-6). Tufts junior defender and assistant captain Cooper Stahl posted two assists in defeat. Before its loss to Middelbury, however, Tufts extended its win streak, which began with a 3–0 victory over Saint Anselm on Nov. 23. Tufts displayed its offensive potential in statement victories over Saint Michael’s and Williams on Nov. 23 and Nov. 30, respectively. Of the Jumbos’ 13 goals in the three games, 10 different players tallied a score, with others contributing assists and key plays. Against Williams, Tufts struck early, going up 3–0 with goals from sophomore forward Mason Babbidge, junior forward Machlan Sawden and first-year forward Brendan Skarda. Junior forward Tyler Scroggins added a fourth early in the second period. Two goals from Williams first-year forward Nick Altman, the first of which came on the power play, halved the deficit for the hosts. Unfazed, the Jumbos potted two more goals to secure a 6–2 victory. Three days earlier, Tufts defeated Saint Michael’s 4–0. Schultze put the Jumbos ahead just past the halfway mark of the first period through assists from junior forward Anthony Farinacci and first-year forward Justin Brandt. First-year forward Angus Scott doubled his team’s lead with less than five minutes left in the second period. Senior forward and captain Clay Berger scored the team’s first short-handed goal this season to increase Tufts’ advantage early in the third, before sophomore forward Charley Borek scored the team’s fourth and final goal. For junior defender Jordan Haney, watching his younger teammates score their first collegiate goals made the three-game winning streak even more rewarding. Defensively, Hotte and first-year goaltender Josh Sarlo allowed just two goals in three games. Hotte recorded his first shutout against Saint Anselm and tallied 55 saves in two 60-minute starts against Saint Anselm and Williams. Sarlo pitched in with a 15-save shutout effort in a full start against Saint Michael’s. Tufts is becoming familiar with its defensive zone scheme, having gone from allowing eight goals in the opening three games to the defensive lockdown it displayed during its winning streak. The second half of November demonstrated the team’s improvement. “After starting 0–3, we worked hard and figured things out,” Schultze said. Tufts has also enjoyed its roster’s depth this season, with every player playing in at least one game so far. In addition, 20 players have played in five or more games this season, with 17 contributing a goal or assist. While veteran leaders like Berger and junior forward Ross Delabruere have led the way in scoring and assists, respectively, the young core for the team is stepping up, too, with Schutlze, Brandt and Scott all contributing three points so far. Looking ahead, the short December schedule offers two more important matches before a month-long break for the holidays. Both matches remaining are home clashes against NESCAC opponents in Bowdoin and Colby. These games have big implications for the NESCAC standings. Tufts holds a 1–3 conference record, but victory in these two games would allow the team to improve to a .500 conference record. The pair of games is also a chance for Tufts to better its 1–2 record at home. With wins in these games, Tufts would find itself in a favorable position heading into break with a 3–3 conference record and a 5–4 overall record. Looking ahead to those games, Schultze said the team’s mentality is simple. Strategy-wise, generating additional shots and pressure will be key to getting the offensive firepower the team needs. Tufts begins its final stretch before the break on Dec. 7 at 7 p.m. against Bowdoin and continues on Saturday with a showdown against Colby the next day at 4 p.m.